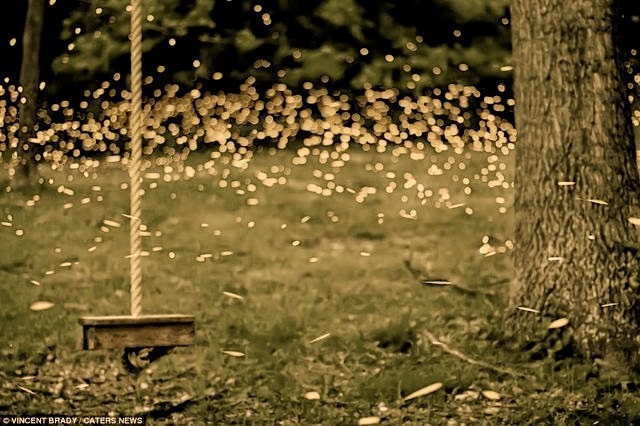 A Year of Being Here: Rolf Jacobsen: "The Fireflies"
with flashes of light around your head. "The Fireflies" by Rolf Jacobsen, from North in the World: Selected Poems of Rolf Jacobsen. Translated from the original Norwegian and edited by Roger Greenwald. © University of Chicago Press, 2002. The Norwegian text can be found on page 298 of the digital text. Art credit: "Fireflies by the Ropeswing, Lake of the Ozarks, MO," time-lapse photograph by Vincent Brady (originally color).